Over the course of a few years, the cryptocurrency and blockchain space has become one of the most attention-getting industries in the world. As this space has grown, so have crypto and blockchain events. Many crypto enthusiasts are realizing this is the opportune time to organize a crypto conference in order to facilitate the discussion of this growing technology and to help push the industry forward. If you happen to be one of these enthusiasts (or work with one of those enthusiasts), this guide is for you. The following tips and best practices are meant to help to take your crypto conference from idea to reality. It shouldn’t come as a surprise that cryptocurrency events have experienced quite the boom over the past few years - a reflection of how rapidly the crypto industry has grown on a global scale. According to Bizzabo’s recent event marketing statistics, 95% of marketers agree that live events provide attendees with a valuable opportunity to form in-person connections in an increasingly digital world. Conferences give crypto and blockchain enthusiasts the rare opportunity to physically meet with people who are just as passionate about the future of the industry. Because a crypto conference is still an event at the end of the day, many of the same best practices of a sound event strategy apply to these conferences as well. This blog post will aim to combine the basic principles of event marketing with the nuances of the crypto/blockchain industry to help you create an effective event marketing plan. Before the bulk of your planning is underway, set aside time to find an event management software to help build your conference. Planning a crypto event consists of many moving parts and having a centralized control panel for all of your event needs—from website, to registration, to social media, to event analytics—will make the entire process more efficient and effective. When searching for the right event software, there are many factors to consider—like event data security, branding capabilities and systems integrations. Check out the below guide to find the software that is right for your needs. In a time where crypto conferences are flooding people's calendars, it is especially important to strengthen the organic search performance of your event. Use the following three tips to help make your event website more discoverable. Targeted keywords - If you were to distill the value of your crypto or blockchain event into three or four words, what would those words be? Be strategic and consistent with the keywords you choose because this will influence the rest of your SEO strategy, both paid and organic. Spend enough time thinking about the keywords you want to rank for, making sure that you are differentiating yourself from other similar events in the space. Google Search Console - Once your event website is ready to go live, sync it with Google Search Console to optimize its SEO performance. Google Search Console is a free tool that will help maximize your site’s discoverability through a multitude of features such as debugging pages, revealing opportunity keywords, and performance reports. Link building - Your event website’s SEO can improve drastically if a significant amount of other websites, specifically reputable ones, host links that lead back to your page. To build this network of backlinks, reach out to crypto and blockchain publications that may be willing to include your event website link on their page. A good way to kill two birds with one stone is to request to be featured on blockchain event directories. This way, people looking for blockchain events will come across your event and it will also serve as a backlink to your event website. Not everyone will be attending your crypto event for the same reason. Founders of an early-stage blockchain startup and an executive VP from a global bank will be looking for different takeaways from your event. Keeping this in mind, segment your email campaigns by role and industry to ensure that the messaging is as relevant as possible. Although not a crypto conference, Zoomtopia’s email campaign did a great job of segmenting for roles and delivering relevant content. In their emails sent to associate level employees, they attached a “letter to management” that readers could use to help persuade the decision makers in the company to register for the event. If you already have the a database of email addresses, you can use that contact info to retarget them on other channels such as Facebook, LinkedIn, and Google Display Network. This is known as custom audience building which is a form of retargeting ads. The main advantage here is that once you’ve emailed a potential attendee, you’re then able to offer the same value proposition across platforms which keeps the messaging frequent and consistent. Targeting your email database from all angles will prove effective in the end. After landing on the registration page, there are bound to be people who do not complete the process. Instead of settling for these losses, send follow-up emails to these specific individuals encouraging them to finish registering. The above image shows how Bizzabo captures data on lost registrations, helping the event organizer recover these attendees. Targeting these individuals will be more cost effective than constantly trying to receive new registrations. Using an event app will be crucial in engaging your attendees throughout the conference. Consider the following tips to maximize the use of your event app. Community messaging - One of the main reasons people attend crypto and blockchain conferences is to connect with other enthusiasts about the technology. Your event app should facilitate these connections by having a built in messaging platform. Encourage people to message each other leading up to the conference to ensure that attendees will be actively seeking one another during the event. Live polling - During speaker sessions and workshops, conduct live polls through the app to collect real-time input from your attendees. This will keep them engaged while also allowing you to collect real-time feedback that you can use to make improvements throughout the event. Interactive agenda - To make your event feel as personalized as possible, attendees should be able to customize their schedules. Additionally, each session on the agenda should be ratable so you can collect feedback in real time. The agenda on the event app is a crucial factor of the overall event experience and you’ll want attendees using it to their full advantage. Given the high-energy, fast-paced nature of the crypto and blockchain industry, it will be easy for the conference to pass by without properly reassessing each day. Be proactive in controlling the pace of your event by sending a recap email to all attendees after each day. This will help keep your team accountable for mishaps that may have occurred as well as assure your attendees that even amidst the chaos of your crypto event, you are doing everything you can to ensure that the next day of the event will be even better. The above example shows how the team at the Pulse conference maintained a positive event experience by sending a recap email to all attendees. This is a good way to keep attendees informed and engaged while also setting a high bar for yourself and your team to deliver on an excellent event experience. An opportune time to promote event registration is while attendees are already gearing up for the current year's event. 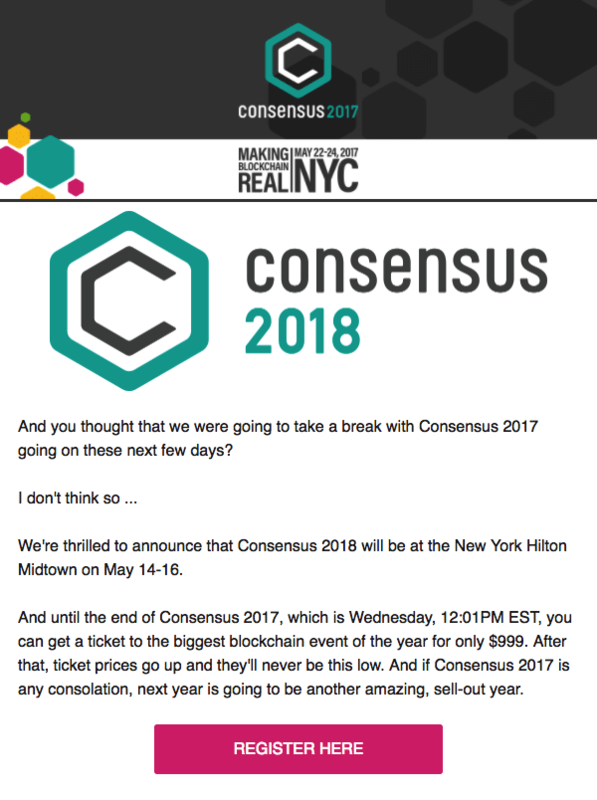 CoinDesk did this successfully by promoting their 2018 Consensus conference, one of the largest crypto conferences in the world, while attendees were focused on the 2017 conference. The timing turns out to be ideal because attendees are already excited to be at the event. By putting next year’s conference on their radar while they're still enjoying the event, this creates a positive association which can encourage attendees to register sooner than expected. Given that cryptocurrency, blockchain, and fintech are all very hot topics, this is an opportune time to create a PR strategy. Reach out to a variety of publications to pitch a story about your event and how it differed from the other crypto and blockchain conferences. If you prefer writing your own article, you can use tools such as PR Newswire to send your article across hundreds of different publications to expand your reach. Whichever method you choose, having some kind of PR strategy that will help to maintain the momentum of your event. Take note which channels performed best in terms of marketing your event. Break down the audience demographic and see whether this aligned with initial expectations. In general, share all important findings with key stakeholders and start thinking of ways to improve the strategy for your next crypto event. Event Description: Taking place in Hong Kong, TOKEN2049 is one of the largest digital asset events in Asia. The conference brings together people from some of the most exciting crypto projects and digital asset funds to share their knowledge and stories. Key Takeaway: Be strategic with your keywords. By using words like “token” and “digital asset”, TOKEN2049 stands out from the other cryptocurrency conferences. Event Description: As of 2018, Consensus became the largest blockchain-focused event in the United States, attracting over 8,000 attendees. The event featured world-class speakers such as the the heads of crypto strategy at JPMorgan and Credit Suisse. There was also a hackathon leading up to the event that helped create event more momentum. Key Takeaway: Create smaller events, such as hackathons or pitch competitions, to compliment your larger event in order to maximize momentum. Event Description: World Crypto Con focuses on empowering people to fully understand the power of blockchain technology and to use that knowledge to make a positive global impact. With over 3,000 attendees and 150 exhibitors coming together in Las Vegas, this conference aims to make blockchain and crypto knowledge more accessible and consumable for all. Key Takeaway: Differentiate the messaging of your event to make it unique from the other crypto conferences. While most crypto conferences are preaching to the choir, World Crypto Con strives to make the blockchain conversation more inclusive while still encouraging innovative conversation. Event Description: Crypto Invest Summit is a curated and thought-provoking summit that features the world’s foremost innovators and thought-leaders in the blockchain and crypto ecosystem. One unique aspect to this summit is the Pitch Stage where ICOs get to present their Initial Coin Offering in front of investors. ICOs must apply and be selected for the competition through the event website. Key Takeaway: Create specific opportunities for ICOs to meet with investors to add more excitement for your event. Maximize the SEO performance of your event website by having a strong keyword strategy and by using free tools such as Google Search Console. What makes the crypto and blockchain world so exciting is that there are still many stones left unturned. The amount of knowledge there’s left to explore is enough to motivate countless crypto enthusiasts to create their own conference. We hope this guide will serve as a resource to assist you on your crypto conference-planning journey.